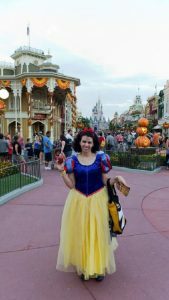 Pace Spanish teacher Paula Pontes loves everything about Disney from the classic movie “Snow White,” to the magic of Walt Disney World in Orlando. Dr. Pontes first visited Disney World in 2004, and since 2007, she and her husband Diogo Pinheiro have returned every Thanksgiving and Christmas. They also try and go during the summer and whenever they have a chance during other breaks from school. Their past trip there on the Martin Luther King, Jr. holiday weekend was their 70th time visiting Disney World. “Disney World is a whole new world,” said Dr. Pontes.“[The first time] I saw the castle I started crying because it meant I had achieved what I thought was impossible.” Growing up in Brazil, Dr. Pontes went to a private school on scholarship. A lot of her friends went to Disney World for their 15th birthday, but she knew her parents would never be able to afford a trip there. “Since we go so often, we don’t feel the pressure to do it all,” Dr. Pontes said. “And since we know a lot, there is no stress of trying to figure things out. [We] just rest and [don’t] worry about a thing.” Dr. Pontes and her husband never get bored there because there’s always something new each time they visit. This past summer “Pandora,” a visually magical world, was added to Disney World and Dr. Pontes is looking forward to the additions of “Toy Story” in 2018 and “Star Wars” in 2019.